Background: Parturient undergoing elective cesarian delivery (CD) in a busy tertiary care referral hospital often requires blood transfusions. The preoperative ordering for blood crossmatch frequently overshoots the actual need of transfusion. Aims: The primary aim of this study was to audit the local blood ordering practice in obstetric anesthesia and compare with the international guidelines. Materials and Methods: A retrospective analysis of patients who underwent elective CD over a period of 6 months was done. The data collected included patients' age, pretransfusion hemoglobin, timing of transfusion, number of units crossmatched, and number of units transfused. The crossmatch transfusion ratio (CTR), transfusion probability, and transfusion index were calculated from the data. Results: A total of 425 patients underwent CD with mean age 33 (standard deviation 7). Seventy-seven (18%) of them were crossmatched with total 252 units. Thirty-one (7.3%) patients required transfusion and the number of units transfused was 79. CTR in our study was 3.2. Conclusion: CTR for elective CD is higher than the recommended international quality indicator value. There is a need to develop institutional specific blood ordering schedule to bring improvement in transfusion practices. Blood is a valuable resource and its efficient utilization is an important quality indicator of the modern health-care system. There is over ordering of blood preoperatively for most of the surgical procedures generally and cesarian delivery (CD) especially. This leads to an increased workload on the transfusion services of the hospital, potential for exhaustion of blood bank resources, and increase financial burden. The introduction of transfusion guidelines and blood order schedules based on evidence have resulted in increased efficiency and decrease the workload on transfusion services. Formulation of strict guidelines for transfusion practices can improve the appropriate use of precious resource. British society of hematology has suggested guidelines based on crossmatch transfusion ratio (CTR) to assess the quality of transfusion practice. It suggests that CTR should not be more than 2:1, meaning that at least half of the requested crossmatch blood should be transfused. 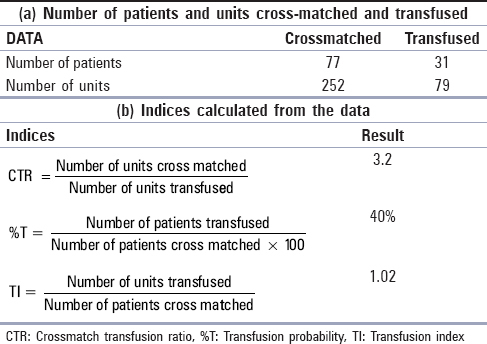 Transfusion probability (%T) and transfusion index (TI) are also calculated to assess the crossmatch ordering practice. The main aim of this study is to audit the blood utilization in elective CD. CTR of <2 indicates a considerable requirement of blood transfusion during surgery. It should be ideally <2. Any value above 50% is considered adequate. TI = Number of units transfused ÷ Number of patients crossmatched. The average number of units used per patient crossmatch is indicated by the TI. A value >0.5 is considered indicative of significant blood utilization. A total of 425 patients underwent elective CD in 6 months. The mean age of patients was 33 years (standard deviation 5.8). Of 425 patients, 77 (18%) had been crossmatched, and the total number of cross-matched units was 252. Of 77 patients that were crossmatched, 46 did not require transfusion. The number of patients that were transfused was 31, and the total number of transfused units was 79 [Figure 1]. The percentage of patients that required transfusion perioperatively during elective CD was 7.3%. The CTR for elective cesarean section was 3.2. %T as calculated from the data was 40%. Moreover, TI was 1.02 [Table 1]. Intraoperative blood loss is over assumed and has resulted in over-ordering of blood in the perioperative setting since a long time. The decision to transfuse is frequently based on subjective assessment in a particular procedure and the need to develop or follow a blood order and/or transfusion policy is frequently overlooked. This trend is more commonly observed in developing countries where the data have shown gross over ordering of blood in 40%–70% of transfusions., CTR is one of the tools to evaluate the efficiency of transfusion policy and was first described by Boral and Henry. The overall appropriate ratio is considered to be 2 or lower, and this can be used to benchmark clinical practice. This means that at least 33% of the cross-matched blood should have been needed for transfusion. Any figure greater than this is not justified. In our study, 11% of all the patients booked for elective cesarian section had been cross-matched, though only 7.3% required transfusion. In this audit, the CTR for elective cesarian section is 3.1, which indicates that only 25% of the cross-matched blood is transfused. It seems that the major reason for this high blood crossmatching order is the lack of any institution-specific blood ordering policy and the fear of unavailability of blood in any urgent situation. The probability of blood transfusion (%T) is another index to assess the appropriateness of blood transfusion. This was described for the first time by Mead et al. in 1980. Value of >50% is desirable and indicates considerable requirement of blood. Transfusion probability (%T) in our study for elective CD was 40%. This is less than the recommended international guidelines. 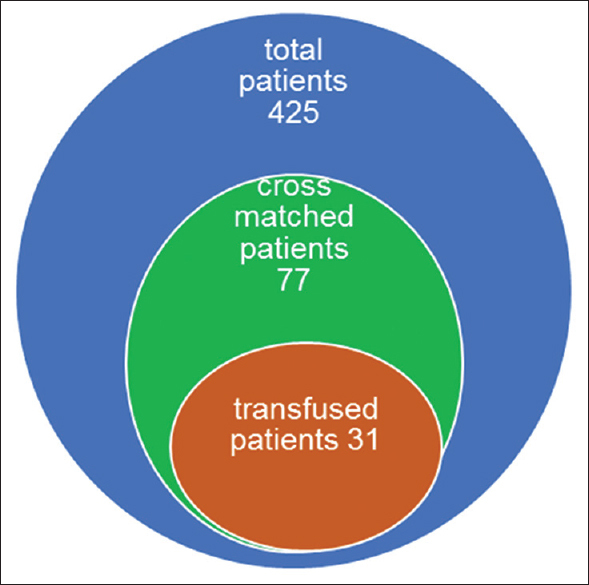 This shows that only 40% of the patients that were cross-matched required transfusion. Another criterion is the TI, which is the average number of units used per patient, the values >0.5 are considered an indicator of quality of blood utilization service. For procedures that require <0.5 units of blood, crossmatching preoperatively is not necessary.,, The TI in our study is 1. Preoperative Anaemia was the main indication for transfusion. 58% of transfusion (18 out of 31 patients transfused) was done in patients with preoperative anemia. The mean hemoglobin (Hb) preoperatively in these patients was 8.7 g/dL. For 40 units crossmatched, 36 were transfused in these patients. However, the highest number of crossmatch was done for patients with placenta previa. 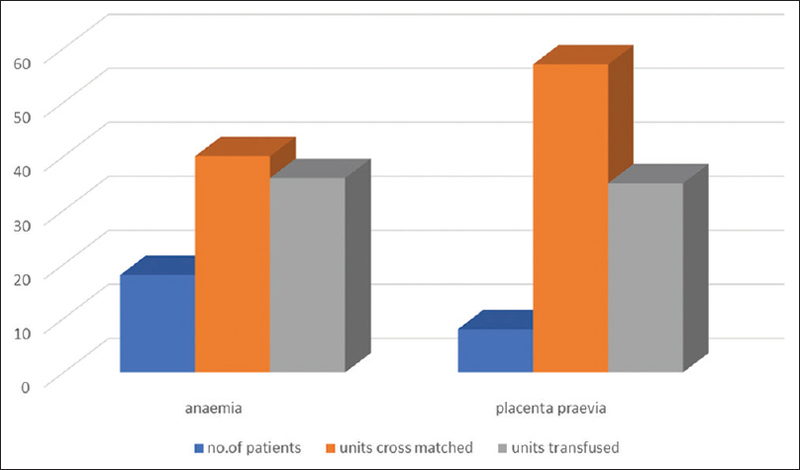 For the eight patients diagnosed with placenta previa, 57 units of blood were crossmatched, out of which 35 were transfused [Figure 2]. Hospitals worldwide have adopted a maximum surgical blood order schedule (MSBOS) for reducing unnecessary preoperative crossmatching. This results in establishing uniformity in practice and a tool to assess the blood ordering practice and its effective utilization. A MSBOS provides guidelines by recommending the number of units of blood to be cross-matched preoperatively for the most commonly done elective procedures. This eventually results in a reduction in the number of preoperative crossmatch requests. Implementation of MSBOS has almost universally resulted in substantial reduction of direct and indirect costs. It has been proven to be one of the most effective means for reduction of blood wastage by outdating and better use of the available blood resources. It is an important quality indicator of blood ordering practice and audits done worldwide has shown remarkable reduction in workload and cost on the blood transfusion services by the implementation of institution-specific MSBOS. However, it is important to consider that implementation of such a blood ordering policy may not be possible without the cooperation and mutual understanding of all entities involved, such as anesthetist, surgeons, hematologists, and blood bank service. Anesthetists and surgeons need to be sure about the availability of blood in time if MSBOS are implemented. The blood bank service and hematologist should take the clinicians in confidence that in case of any emergency, blood can be available within 5–7 min after undergoing a rapid spin crossmatch. The distance of the ward and the operating theaters from the blood bank unit is also a limiting factor to the effective implementation of MSBOS. The policy of “group, save, and screen” is adopted worldwide. Many surgical procedures are performed by just ordering “group, save, and screen” instead of crossmatching. This has shown to be safe and an effective way to reduce unnecessary perioperative crossmatching of blood., In some institutions, even the rapid spin and crossmatch is not done if the antibody screen is negative. ABO and Rh compatible blood is cross-matched electronically from the blood bank record and can be immediately released for transfusion. Surgical blood order equation (SBOE) is and advanced evolution of MSBOS. SBOE is formulated by incorporating other factors such as pre- and post-operative Hb and perioperative blood loss. This results in better and accurate assessment of blood loss and the subsequent need of blood transfusion for specific procedures. Multiple studies have shown SBOE to be more effective than MSBOS in reducing the wastage of blood and improving the quality of transfusion services., A transfusion rate of 1%–14% is suggested by review of literature for blood transfusion following cesarean section. The percentage of patients transfused for elective CD in our data is 7.3%. The perioperative ordering of crossmatch is based on subjective assessment of anticipated blood loss and physicians own transfusion experiences. It is not dependent on evidence-based guidelines, and hence results in nonuniform trend of blood ordering practice for similar procedures and indications. A major percentage of crossmatch and subsequent transfusion was done in obstetric hemorrhage cases. Being a busy tertiary care referral center dealing with a large number of complicated obstetric deliveries, there is a strong need to develop a clear local protocol based on institutional audits. These protocols should be updated regularly. The protocols and guidelines should also be practiced in skill drills and should be clearly mentioned and displayed in the relevant areas and to all involved entities including the obstetricians, anesthetists, paramedics, and blood bank service personal. This would lead to decrease workload and decrease level of stress and hence improve in service. This study provides a baseline as a benchmark, which can later be compared with future transfusion audits. We recommend conducting a multidisciplinary study involving other surgical specialties as well that can help to formulate the MSBOS. Once an appropriate model is implemented, the compliance with the international guidelines and recommendations can be observed. Blood ordering and transfusion audit is an important measure that needs to be carried out regularly in all transfusion services and hospitals. These audits serve as a surveillance tool which can help in formulating guidelines. This was demonstrated in the Clarke et al. study, in which blood audits were used to implement evidence-based crossmatching protocols, which resulted in significant savings in time, workforce, and money. This study should be considered a first step toward the making of an MSBOS and defining criteria for crossmatching patients with high risk for bleeding as listed earlier from identified risk factors for transfusion. The short duration of this study is significant limitations as it might not reflect long-term practice and trends. It is recommended that MBOS should be revised yearly on the basis of the latest available data to keep it responsive to the changing needs of the hospital. CTR in our study for elective CD is 3.2 which is higher than the international recommended quality indicator. Transfusion probability is 40% which is less than the recommended international guidelines. Transfusion index in our study is 1.02, which is an indicator of blood utilization quality. However, this can be a false predictor due to the high number of blood utilized by a small group of patients with placenta previa. The data overall indicates a strong need to develop institutional specific blood ordering schedule to improve the quality of blood utilization. Pozo AE, Pérez-Rosales MD, Almeida-Neto CD, Remesar MC, Cortes AD, Delgado RB, et al. A comprehensive protocol to evaluate the use of blood and its components in Latin America and the Caribbean. Rev Panam Salud Publica 2015;37:435-41. Alavi-Moghaddam M, Bardeh M, Alimohammadi H, Emami H, Hosseini-Zijoud SM. Blood transfusion practice before and after implementation of type and screen protocol in emergency department of a university affiliated hospital in Iran. Emerg Med Int 2014;2014:316463. Krier DB, Richards FE. Transfusion-to-cross-match community comparison data. Am J Med Qual 1996;11:68-72. Friedman BA, Oberman HA, Chadwick AR, Kingdon KI. The maximum surgical blood order schedule and surgical blood use in the United States. Transfusion 1976;16:380-7. Juma T, Baraka A, Abu-Lisan M, Asfar SK. Blood ordering habits for elective surgery: Time for change. J R Soc Med 1990;83:368-70. Waqas M, Shamim MS, Ujjan B, Bakhshi SK. Prospective validation of a blood ordering protocol for elective spine arthrodesis and its impact on cost reduction. Surg Neurol Int 2014;5:S362-4. Hardy NM, Bolen FH, Shatney CH. Maximum surgical blood order schedule reduces hospital costs. Am Surg 1987;53:223-5. Boral LI, Henry JB. The type and screen: A safe alternative and supplement in selected surgical procedures. Transfusion 1977;17:163-8. Frank SM, Oleyar MJ, Ness PM, Tobian AR. Reducing Unnecessary Preoperative Blood Orders and Costs by Implementing an Updated Institution-specific Maximum Surgical Blood Order Schedule and a Remote Electronic Blood Release System. Anesthesiology 2014;121:501-9. Mead JH, Anthony CD, Saltier M. Hemotherapv in elective surgery. An incident report, review of literature and alternative for guideline appraisal. Am J Clin Pathol 1980;74:221-7. Friedman BA. An analysis of surgical blood use in United States hospital with application of the maximum blood surgical blood order schedule. Transfusion 1979;19:268-78. Smallwood JA. Use of blood in electivc general surgery: An area of wasted resources. Br Med J 1983;286:868-70. Napier JA, Biffin AH, Lay D. Efficiency of use of blood for surgery in South and Mid Wales. Br Med J (Clin Res Ed) 1985;291:799-801. Mintz PD, Lauenstein K, Hume J, Henry B. Expected hemotherapy in elective surgery. JAMA 1987;239:623-5. Nuttall GA, Horlocker TT, Santrach PJ, Oliver WC Jr., Dekutoski MB, Bryant S, et al. Use of the surgical blood order equation in spinal instrumentation and fusion surgery. Spine (Phila Pa 1976) 2000;25:602-5. Sakurai Y, Okada C. Comparison by simulation of the efficiency of surgical blood order equation (SBOE) with that of maximum surgical blood order schedule (MSBOS). Masui 2001;50:69-75. Rebarber A, Lonser R, Jackson S, Copel JA, Sipes S. The safety of intra-operative autologous blood collection and auto transfusion during caesarean section. Am J Obstet Gynecol 1998;179:715-20. Clarke A, O'Malley M, Hegarty JF, Freeman BJ. Blood audit evidenced-based cross-match requesting for lumbar spine surgery. Spine (Phila Pa 1976) 2006;31:E373-5.